Red Grid 2.0 is a new formulation that has the same great vibrant colors, but a new softer hand (feel). It is our best inkjet heat transfer paper for color retention. With an easy peel and superior color. 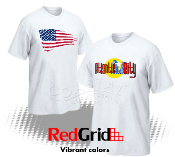 Red Grid is the choice that many customers make when choosing a transfer paper for bright, vivid images. Perfect for artwork, photos and more! Red Grid transfer paper is compatible with most cutters. Red Grid 2.0 is a new formulation that has the same great vibrant colors, but a new softer hand (feel). It is our best inkjet heat transfer paper for color retention. With an easy peel and superior color.